In the Fall 2018 semester, the SNU Diversity Council released its second annual diversity report. By providing updated statistics on the SNU community, the annual report is a means to assess the university’s progress on diversity and internationalization. 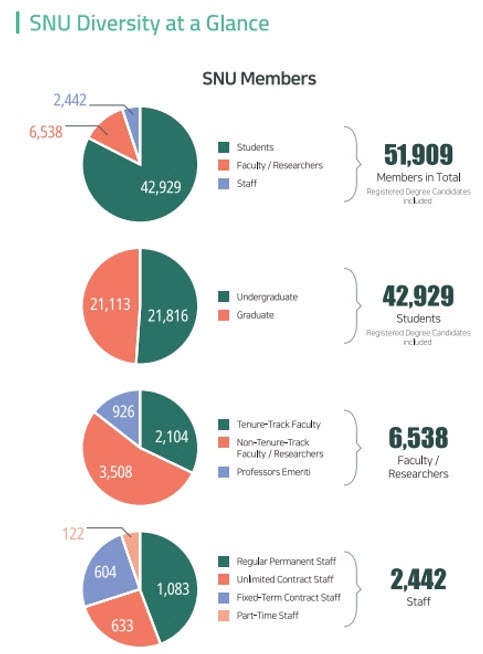 According to the report, the SNU community consists of 51,090 members which includes 42,929 students, 6,538 researchers and faculty, and 2,442 employees. The report found that, though the representation of full-time female faculty members has increased slightly from 2016, a large gender imbalance still exists. In 2017, women accounted for only 15.5% of full-time faculty and 35.8% of undergraduate students. The report also assessed the status of internationalization at SNU and proposed short and long-term policy recommendations. Of the 10,904 lectures offered at SNU last year, 11 percent, or 1,237, were conducted in English. The report highlighted the importance of not only increasing the number of English lectures but also providing a wider range of services in English and more systematic support to foreign students, such as peer tutoring. The report also underlined the need to address important issues faced by the international community of SNU in areas such as housing, healthcare and opportunities for promotion. While diversity reports have become common in many universities around the world, SNU is the first university in Korea to publish such a report. Through activities such as carrying out diversity-related research, developing policies for the protection and advancement of diversity, and hosting events to facilitate communication about diversity within and beyond SNU, the council aims to help foster a diverse and inclusive campus that actively recognizes, embraces and celebrates difference.